ShotSpotter, Intelsat, and Turtle Beach have been among the big market winners this year. Investing legend Peter Lynch understood that not every stock you buy has to be a winner. He wrote, "All you need for a lifetime of successful investing is a few big winners, and the pluses from those will overwhelm the minuses from the stocks that don't work out." While you shouldn't enter the stock market looking for overnight successes, three investments that have really paid off over the past year and could count toward a few of your big winners are ShotSpotter (NASDAQ:SSTI), Intelsat (NYSE:I), and Turtle Beach (NASDAQ:HEAR). 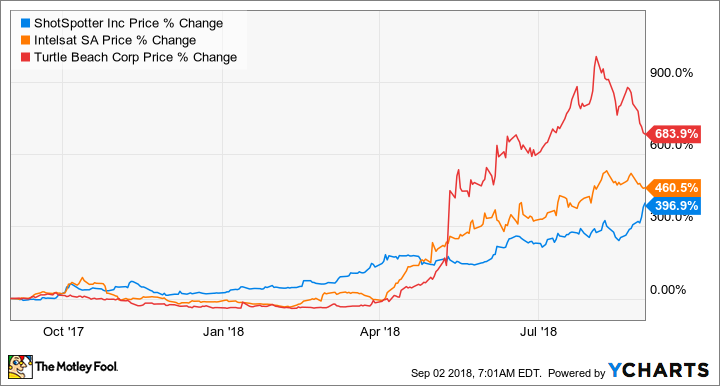 Over the past 12 months they have generated returns of 396%, 469%, and 718%, respectively, meaning that if you'd invested $8,000 combined into these three companies one year ago, you'd have $50,230 today. ShotSpotter uses its unique technology to detect gunshots, analyze their location, and rapidly send a report to law enforcement and security companies that subscribe to its service for a response. Last year, ShotSpotter had 77 public-safety customers covering approximately 510 square miles in 88 cities across the U.S., including three of the country's 10 largest cities. It also had seven security customers covering eight college campuses. Revenue grew 53% in 2017 as it signed up more customers, and it's up another 52% over the first two quarters of 2018. ShotSpotter expects full-year revenue to more than double to as much $34 million, and though it isn't profitable yet, it expects that to change by this year's fourth quarter. The revenue it generates is based on per-mile calculations, so there's still plenty of mileage to grow in the U.S., and it's beginning to look overseas for international expansion. More importantly, there's no real competitor to ShotSpotter's wide-area detection technology. After bumping along at around $5 a share for the better part of two years, satellite operator Intelsat enjoyed multiple days of double-digit-percent stock price increases beginning in April, often on rather mundane reports. But reports indicating the Federal Communications Commission was examining Intelsat's proposal to open up the C-band wireless spectrum for wider commercial to support 5G networks use really got the stock going. 5G networks, of course, are the next level of support needed for the connected home, as well as greater proliferation of artificial-intelligence systems and even self-driving vehicles. Intelsat, along with fellow Luxembourg-based communications satellite operator SES, controls 90% of the C-band spectrum, and a favorable opinion from the FCC allows them to devote 20% of their airwaves for mobile network operators, such as cable and broadcast TV companies, to use them for new purposes. There's a lot of promise built into the stock's astronomical rise, but it could pay off in the future if these sky-high ideas come to fruition. Acting more like hare than tortoise, computer and video-gaming accessory specialist Turtle Beach had been one of the market's top performers this year, before giving up about a third of its value from its 52-week high. Even so, it still has outperformed most stocks as it benefited from the rising popularity of so-called "battle royale" games such as the crazy-popular Fortnite, where communicating with other players is an essential component of game play. Because it owns nearly half of the console video-gaming headset market in North America, and because it's taking measures to strengthen its balance sheet, Turtle Beach has become a market darling as well as a game player's dream. Its high-quality headsets set the standard for others to follow. The problem with the stratospheric rise is that the battle-royale style of online video-gaming may be more fad than trend, and Turtle Beach's equipment are not high-turnover devices, so growth could be limited. Even so, it still looks reasonably priced based on numerous metrics. The stock, for example, is trading for only nine times trailing earnings and 12 times next year's estimates. With its price-to-earnings ratio at just a fraction of analyst forecasts of long-term earnings growth and the stock going for 17 times the free cash flow it produces, Turtle Beach might still have room to run.